Using my ZPacks bag on a chilly Oregon morning. In my quest to reach an ultralight base weight, one of the first hurdles I came to was replacing my old synthetic sleeping bag with a down bag. I knew I would easily spend over $400 on this endeavor, so this was not a decision I took lightly. I needed something that I could use in spring and autumn, as well as in the summer. I bought the ZPacks 10 degree F sleeping bag, sized long and wide. I’ve owned this sleeping bag for a year and a half now. In total I’ve used it for 4 months last summer on the Appalachian Trail, 3 1/2 months while tea house trekking in Nepal’s Himalya mountains, 2 weeks in the Peruvian Andes, and for 6 months this year while working in the Utah desert (not including my days off). 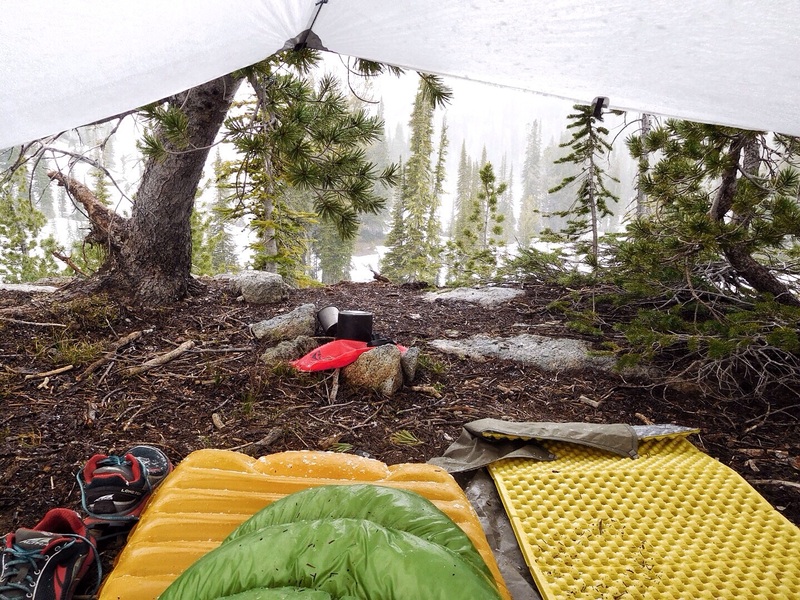 What do I like about my ZPacks sleeping bag? The particular sleeping bag that I have weighs 23 ounces, thus sufficiently assisting me in my goal to become ultralight. I regularly get compliments on how small my sleeping bag packs down to. The lack of a hood contributes to the low weight. If it is cold out I’ll sleep with a hat on. It is fluffy. There’s no shortage of loft in this bag. It was recently seeming flatter than usual. I wondered if after 1 1/2 years of heavy use my sleeping bag was not quite what it used to be. Nope. After being washed and dried the sleeping bag puffed right up like it was new again. Just be sure to carefully follow instructions for washing down sleeping bags. It is warm enough for 3 seasons. I was happy with this bag during summer in the Appalachians, autumn in the Himalaya, and spring in the high desert of Utah. However, I was chilly during the Utah winter while also using a sleeping bag liner. I sleep cold, and I probably won’t use this bag in the future if temperatures are going to be under 25 degree F. If you are a warm sleeper you can push it more. It is durable. When I first got this bag, I wasn’t sure if the thin fabric would hold up. It has. After all this time there is hardly any noticeable wear. Granted, I do give it exceptional care as should any down sleeping bag owner. A low base weight keeps me smiling in the Himalaya. I would like to see a wider foot box. Most of the time my feet are toasty in this bag. When the temperature gets under freezing is when my feet start getting cold. The foot box isn’t lofty enough. Setting up camp in the Andes. Before ordering this bag, take sizing into account. I’m 5’8″ and I wear a women’s size 10. The long and wide version is a good fit for me. I originally ordered a regular size and found it to be too tight around my chest. The company was super helpful with letting me return it and quickly shipping me a different bag. As with any down sleeping bag, take into consideration in what region you will be using it the most. Down sleeping bags have a tendency to soak up moisture from the air. In the Appalachians, I made a habit of stopping as soon as a window of sunshine came along and drying out my sleeping bag. In Utah dampness isn’t a big issue. If it does get a little wet, 10 minutes in the sun is more than enough time to dry it out. If you are going to go with a down sleeping bag be prepared to take care of it like a house plant. There aren’t as many reviews on the 10F ZPacks bags as there are the 20F so I was glad to find yours. I was considering getting a ZPacks 10F bag for my 2018 NOBO AT hike with a mid-February start. However, other hikers on forums suggested I get bags from other makers for that start time. Your review seems to suggest the same. May I ask whether your experience in the Utah winter included wearing insulating clothes during the night? With my start date in mind, what bag would you suggest if not the ZPacks 10F if you were in my shoes? (I’m also female and tend to wake up cold when sleeping outside) Thanks so much! Hmmm, that’s a good question because I think for an later start date this bag would be perfect for an entire AT thru-hike. It sounds like you may have a few colder weeks at the start of your hike. I did wear insulating layers and had a liner during my winter months in Utah. However, the temperature was also colder than what you will see in Georgia in mid-February. I have a Feathered Friends -25 degree bag for this winter and I’m nice and toasty without layers. I don’t have a specific bag to suggest, but something with a hood will keep you warmer than the quilt style. I love Feathered Friends, so I would recommend looking at some of their bags. If you do go with this bag, getting a liner and layering up for the first weeks may do the trick. Interesting that you were cold at temps below 25F, albeit you being a cold sleeper. I bought a Katabatic Gear bag because of their known-underrated temp ratings. The Palisade 30 is the one I purchased and I’ve slept in 17 degrees for 2 nights and was more than warm… and I don’t consider myself a warm sleeper (I’d say average). Katabatic is more expensive, but my god the loft and warmth is unmatched in my quest to stay ultralight and warm on cold nights.